Denver, Colo. (November 2, 2017) – Being the face on an organization is a big responsibility for anyone, but it’s one that 14-year-old twins Ashley and Aspen Somers have accepted gladly since they could talk. Today, they use every platform available to them and they have many to share the message of the Fetal Health Foundation, an organization that their birth inspired. The twins’ parents, Lonnie and Michelle Somers, launched the national nonprofit Fetal Health Foundation (FHF) in 2006 to provide hope, resources and connections to parents who are diagnosed with a fetal syndrome. In 2002, when the Somers were about halfway thru their pregnancy and getting adjusted to the excitement of learning they were expecting twins, they were told that their babies were affected by Twin-to-Twin Transfusion Syndrome (TTTS). TTTS is a rare disease of the placenta that causes one twin to receive all the nutrition and blood and the other to get very little or none. Everything the Somers heard from their doctors and read during online research provided little hope for the survival of the twins. Fortunately, the Somers stumbled upon a doctor’s name through medical periodicals. This led them to Tampa, Florida where they consulted with Dr. Ruben Quintero, who performed minimally invasive intrauterine surgery via tiny 3mm incisions, which saved the Somers’ twin girls. On June 17, 2003, at 35 weeks, Aspen and Ashley were born. Today, the twins are healthy and have achieved enormous success academically and in a variety of extracurricular activities. The girls skipped seventh grade and are now sophomores at Chatfield Senior High School. While in sixth grade, they took the ACT, the nation’s most popular college entrance exam, and both scored in the top five percent with results at or above the national average for high school juniors/seniors who took the test. The twins, who were originally given very poor odds of ever taking a first breath, now entertain crowds of hundreds when they perform in musical theatre productions and student films. Aspen was selected out of thousands of applicants to be a Discovery Girl and was featured in the national Discovery Girls bimonthly magazine. Ashley, who has been regionally recognized for her creative writing, prepared a business plan and opened an online bakery when she was 11. Each of the twins has had her work published in anthologies presented by Colorado Humanities & Center for the Book. One of the many platforms that the twins use to share FHF’s messages is The Great Candy Run. Now in its 14th year, The Great Candy Run was started as the Race for Hope to create awareness of fetal health syndromes. 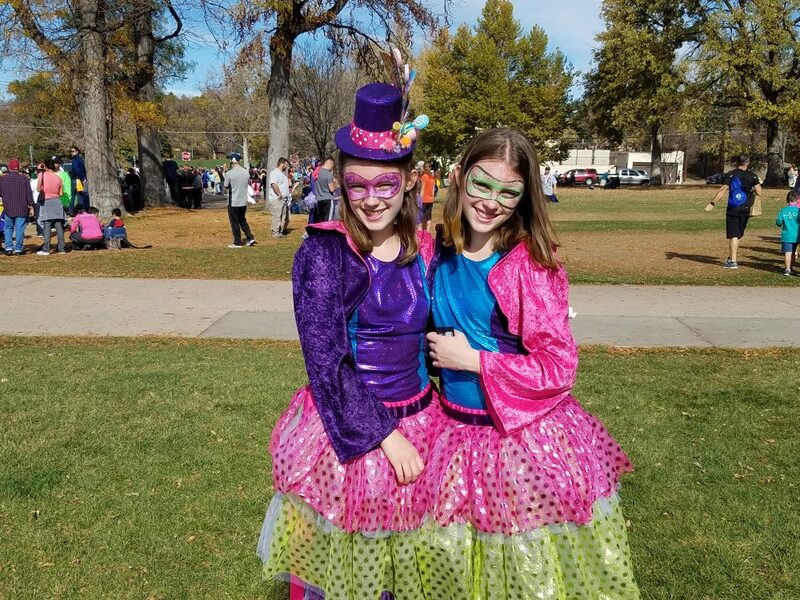 On Sunday, November 12, 2017, Ashley and Aspen will be decked out in their sweetest costumes to welcome people to the Run and Walk taking place at Washington Park and to thank them for their support of FHF, which generates awareness and money to support families with fetal syndromes, and helps fund research to improve fetal syndrome outcomes. The Great Candy Run, presented by the Colorado Fetal Care Center, is a family-friendly event featuring a candy-themed 5K with unique finishers’ medals, shirts and prizes, a free Coda Coffee Kids’ Fun Run, and a Family Fun Zone with games, activity stations, face painting, costume competitions, refreshments, giveaways, entertainment and more. The Great Candy Run has twice been named Best 5K for Kids by Competitor magazine and annually draws 2,000+ children who are participating in their first 5K many thru school running groups or organized running clubs. Ashley and Aspen first participated in The Great Candy Run, which was their first 5K race, at the age of five; today the girls are training for their first half-marathon. Both Somers girls encourage the public to join in the fun at The Great Candy Run and support FHF. Based in Littleton, the Fetal Health Foundation leads the way in supporting families and medical treatment centers dealing with intrauterine fetal syndromes. The 501c3 nonprofit organization connects families diagnosed with a fetal condition to top-rated medical specialists and funds research to improve outcomes in fetal conditions. More information about the Fetal Health Foundation is available at www.fetalhealthfoundation.org. The Great Candy Run series is the primary fundraiser for the Fetal Health Foundation and also serves to boost awareness of fetal condition diagnoses and provide a community of hope for families experiencing these medical challenges. Now in its 14th year, The Great Candy Run is the largest timed 5K in Colorado and has twice been named the “Best Kids Run” by Competitor magazine.